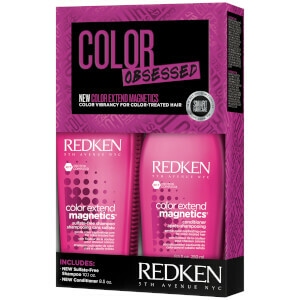 Achieve effortless, flawless style with the Redken Color Extend Magnetics Gift Set. The five-piece gift set contains every product you’ll need to cleanse, protect, freshen and revitalize your hair, leaving locks vibrant, silky-smooth and bursting with life. Style your hair with speed and ease with this protective blow dry oil that works to accelerate the hair drying process while adding mirror-like shine to your locks. Fortified with activated silicones to reduce drying time, the luxurious elixir makes styling hair fast and easy, while its shine-enhancing properties leave hair glistening and silky smooth. Designed to reduce blow drying time, this spray boasts a unique anti-breakage formula which works to protect hair in up to 450°F heat. It repairs strands from the inside out, meaning your locks will be 3x stronger and will boast lasting volume. The heat protection spray also gives the hair a “thermal blanket” of flexible silicone resin which shields from heat for longer. A must-have product for healthy, salon perfect hair. Give day-old hair a boost with this oil-absorbing dry shampoo that instantly freshens and rejuvenates without leaving visible white patches. The lightweight, powder-based spray helps to extend the life of your blow dry, creating full-bodied movement and a soft matte texture. Perfect for correcting product over-use and eliminating greasiness, or to add workable texture and extra grip for flawless up-dos. Glow Dry: Apply on damp hair before blow drying. Reapply after blow dry to finish and enhance. Primer Spray: Shake well. Mist all over damp hair. Dry Shampoo: Shake well and spray evenly onto hair. Brush through to remove any excess. Blast dry using fingers for tousled texture or a round brush for volume. Works best on hair that hasn't been freshly shampooed. Glow Dry: Cyclopentasiloxane, Alcohol Denat., Phenyl Trimethicone, Dimethiconol, Parfum / Fragrance (D173850/1). Alpha-Isomethyl Ionone, Hydroxycitronellal, Hexyl Cinnamal, Linalool, Citronellol, Benzyl Benzoate, Geraniol, Benzyl Alcohol, Hydroxyisohexyl 3-Cyclohexene Carboxaldehyde, Isoeugenol, Limonene, Cinnamyl Alcohol, Ci 17200 / Red 33 (D163127/1) Us Pat. Pending/ Brevet Américain En Instance. Dry Shampoo: Butane, Propane, Alcohol Denat., Aluminum Starch Octenylsuccinate, Aqua / Water / Eau, Parfum / Fragrance, Sodium Starch Octenylsuccinate, Maltose, Diisopropyl Adipate, Disteardimonium Hectorite, Potassium Citrate, Hexyl Cinnamal, Citric Acid, Benzyl Alcohol, Linalool, Amyl Cinnamal, Benzyl Salicylate, Alpha-Isomethyl Ionone, Hydroxycitronellal, Limonene, Citronellol, Geraniol (D192217/1).